One.Walmart.com – OneWire Walmart Login. On January 1 2019, Walmart merged their older WalmartOne and in-store Walmart Wire platforms, and moved both to the new One.Walmart.com website. The new website or platform has been given the name “Walmart OneWire”. This has caused major confusion among many Walmart associates. 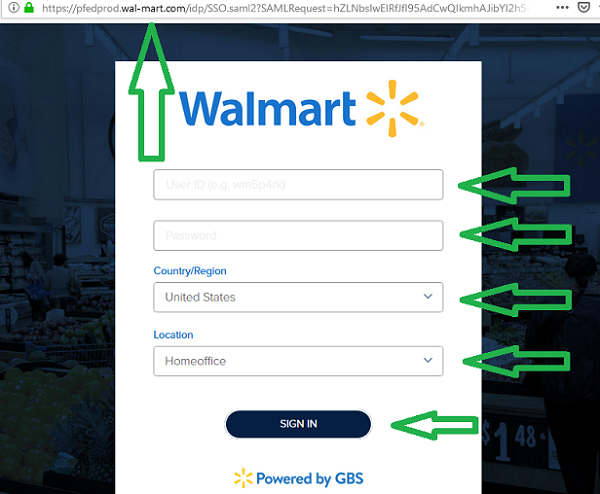 You can still access WalmartOne through the old login link found here, but in the future Walmart wants you to access via https://One.Walmart.com instead. How do I log in to the new One.Walmart.com (Walmart OneWire) website? To access Walmart OneWire, you must have 2-Step-Verification set up from inside an actual Walmart Store. Then, open https://One.Walmart.com in your browser, without “www”. Entering “www.one.walmart.com” will not work. Find the orange Walmart logo located the top left corner of the page, and click on it. The new login page will open. Enter your Walmart User ID in the first box and your Password in the next. Choose country/region and your location, either Store, Homeoffice, or DC. Find the Walmart “Spark” logo and click on it to open the new OneWire Walmart login page. Enter your Walmart User Id and Password, your country and location. In order to log in to the new One.Walmart.com website, also known as Walmart OneWire, you will need go through a 2-Step Verification process. 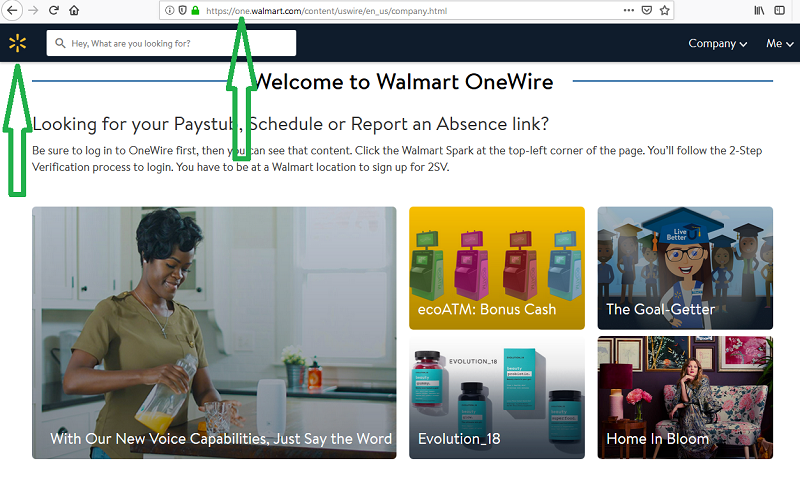 This is the difference between the old WalmartOne portal and the new Walmart OneWire portal. To sign up for 2-Step-Verification, you must be at physical Walmart Store location, as associates cannot sign up for 2-Step-Verification from their home computer or mobile phone. How do I get a 2 Step Verification for access to One.Walmart.com Onewire Walmart at Home? Log in to Walmart Wire at work. Make sure your contact number is up-dated on the Wire to your cell phone number. Enter for “wmlink/2sv” in the address bar. Enter your mobile phone number. After enrolling on the intra-store Wire, you can start using the 2-step verification (2 Factor Authentication or 2FA) and use the Walmart OneWire website from home. With 2-step-verification, you will be sent a new code to your phone every time you sign in with your Walmart OneWire name, password, location, plus the store number. The WalmartOne app will eventually migrate to a new Walmart Onewire app. If you need help with enrolling, then ask your personnel manager. I’m already enrolled in the Walmart BYOD system. Do I have to enroll for 2-Factor Authentication as well? No, if you are already enrolled for BYOD, you do not have to sign up for 2 Factor Authentication, when your are accessing via BYOD. Walmart OneWire Registration – New Employees. You cannot register for a Walmart OneWire account, until your associate information is in all Walmart HR systems. This could be after you receive your first Walmart paycheck, or after a few business days. Re-hires must register for Walmart OneWire again, as former employee accounts are closed, when an associate leaves the company. Where can I download the Walmart Onewire app? There will not be a new Onewire app available to download at this time. Instead, find the link inside the old WM1 app to up-date it for OneWire. Eventually, there will be a new app developed to replace the “My Walmart schedule” app. I Forgot my Onewire Walmart Password and Username. What if I forget my Onewire user name or password? You now use your Walmart username and password. This is username and password, that you use for all Walmart Apps. If you have forgotten your username and password, for on or off the clock help, then call Walmart Field Support at 1-479-273-4357. What is the prefered internet browser for Walmart Onewire? Which browser works best with One.Walmart.com? Google Chrome, Apple Safari and Mozilla Firefox are the recommended browsers. Is One.Walmart.com safe to use? WYour Walmart payroll and benefits information is stored on secure servers. However, your Onewire profile information can be seen on the site, onece they have logged in, by other associates, but only if you select to make your Onewire profile public. How do I find my Walmart WIN number on Onewire? Sign in to the Walmart OneWire portal from your work store location. Find the search box and type “WIN” and press enter. Your WIN number will then be displayed. I cannot find my Walmart Schedule on Onewire. Why not? if you cannot see your work schedule, then please call: 1-700-Walmart. Call from the Store Network, and during your scheduled hours. 1 One.Walmart.com – OneWire Walmart Login. 4 How do I get a 2 Step Verification for access to One.Walmart.com Onewire Walmart at Home? 5 I’m already enrolled in the Walmart BYOD system. Do I have to enroll for 2-Factor Authentication as well? 6 Walmart OneWire Registration – New Employees. 8 I Forgot my Onewire Walmart Password and Username. 9 What is the prefered internet browser for Walmart Onewire? 10 Is One.Walmart.com safe to use? 11 How do I find my Walmart WIN number on Onewire? 12 I cannot find my Walmart Schedule on Onewire. Why not?